First and foremost, I want to send a big thank you out to Mr. Jeff Allen. It appears as though Mr. Allen is on the shelf for the time being due to an injury which is hampering his incredible golfing abilities. So like the dedicated and caring member that he is, Jeff spent the better part of the morning last week, with a utility vehicle filled with divot mix, filling divots on the 12th and 18th fairways. These are the types of tasks that the Turf Crew cannot tend to on a regular basis, and the added help from Mr. Allen is greatly appreciated. 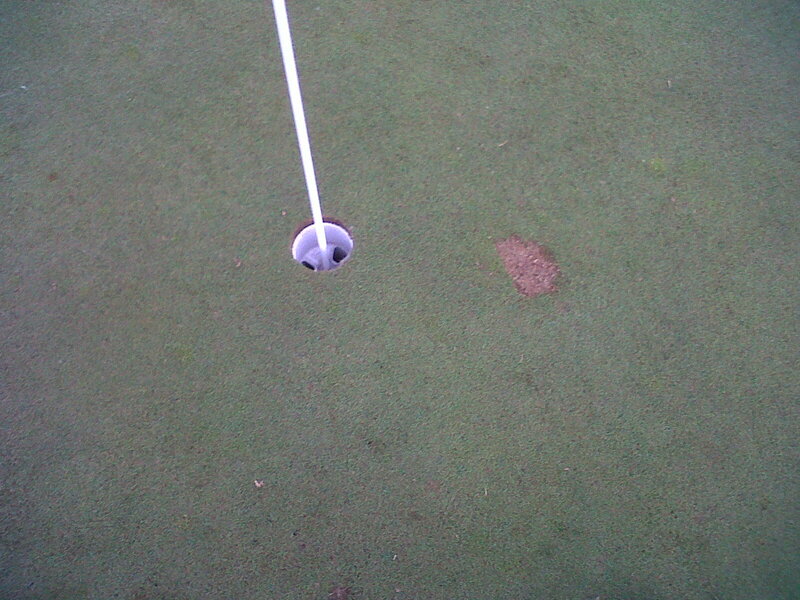 When you come across something such as this, please report it to the Pro Shop immediately. Ideally, we can find the culprits who are responsible for such senseless destruction of your golf course and handle it appropriately. A sure sign that summer is here, was the appearance of our #1 turf disease here at The Saw, and that is Dollar Spot. I began noticing signs of it on the aprons earlier in the week, and by the end of the week, it was to the point where I decided to put it in check. Fortunately we had the course wide open Friday morning, which gave us the opportunity to not only put down our first fungicide application, but to also fertilize and apply our first Plant Growth Regulator application as well. After over a month of struggling to get through the rough on the property with a simple 3 deck mower, we will see the arrival of our replacement unit tomorrow afternoon. This should allow us to get around the property a lot quicker, enabling us to keep the rough happier, and not put it in the situation we have been where we are stunting growth by taking too much of the leaf surface off with each mowing. Ideally, you never cut more than one-third of the plant with any mowing, and to not stress the plant any more than you already do Unfortunately, with the time it has been taking for us to get around the course, by the time we cut most areas we are generally taking more than half of the leaf surface off with each mowing. This in-turn has caused the browning of our Bluegrass rough's. We have fertilized, and anticipate rain over the next few days which should bring some nice colour back to the rough. With the wet spring that we had, it was clear the farm field to the east of the 7th hole was constantly draining, causing issues at both the cart path on #2, as well as our "river bed" across the 7th fairway. Clearly, there has been some reciprocal damage from the amount of water that had flowed through these lines, and its inability to clear the water from this bed. Having said that, there's no other way to describe the right side of the 7th fairway at around the 200 yard mark as anything other than a mess. I am working on a game plan to resolve this issue, and hopefully we can start to see some action in this area shortly.